Yesterday I noticed the first of my snowdrops poking through the leaf mulch. And then I saw a robin hopping around searching for some nesting material. It can only mean one thing. Spring is nearer than today’s snowfall would have me believe. Change is in the air, and in the kitchen. Ready to get cooking? Me too. But first, my friends, we must bid a fond farewell to our current cook-with-me-cook-along-cookbook (I’ve never been sure what we should call these little explorations…) For the last few months we’ve been wandering our way through More with Less by Doris Janzen Longacre. I felt it was time well spent, and I’m glad to have a new friend on my cookbook shelf. Most of the recipes we tried were tasty and pleased nearly everyone at the table. I found all of the recipes to be accessible and affordable, and I mean that in every way possible. From the ingredients to the cooking methods to the serving, these recipes meet my requirements for weeknight dinner. They don’t take much planning, they don’t take much money, and they deliver pretty good results. I took issue with some of the ingredients (like soy flour, margarine, and powdered milk, because I don’t think they are healthful ingredients) but the recipes were easy enough to adapt to my own preferences. And I do appreciate that if we ever ended up in darkest Peru needing to cook dinner, that we could probably find all of these ingredients and cook up a meal there almost as easily as we could here. I’m adding More with Less to the rest of my friends on the book shelf. Surely I’m not the only one who thinks of my cookbooks as characters with personalities? More with Less is that grandmother-ly person who gives you warm hugs, invites you to sit down on a slightly threadbare velvet couch, and serves you a casserole and chocolate cake for dinner. She’s not refined or sophisticated, but she does the simple things well and there is comfort in that. And so, a fond farewell to More with Less. It was lovely getting to know you. And a warm welcome to our newest friend, Fix, Freeze, Feast by Kati Neville and Lindsay Tkacsik (pronounced Ta-sic). This book was written by two moms, wanting to feed their families efficiently, but also nutritiously and affordably. Funny, those are the same things I want! Lindsay was so kind to send me a review copy* of their book so that I could share my cooking adventures with all of you lovely people. And (here’s the great news…) she gave me permission to share the complete recipes on the blog, which is really so generous of her. I hope that everyone is able to enjoy cooking along with me. If you’re new to the concept of freezer cooking (or “batch cooking” as it’s sometimes called) here’s the gist: One recipe is multiplied several times, so that you make a huge batch. One can be eaten right away, and the others go into the freezer. Some people will have one day a month that they do all their cooking, and then eat from the freezer for the rest of the month. Others (like me) will just schedule in one or two meals during the week that will make enough for both dinner that night and the freezer for later. This method works well for folks without a lot of freezer space, or who simply can’t clear an entire day for cooking. I’ve been searching for a while for a good freezer cooking book. I have four young kiddos. There is a myriad of opportunities in my day for my dinner plans to derail. When this happens, I tend to reach for the hotdogs (if we’re lucky, I have some buns in the freezer to put them on). But I really like the idea of having more than hotdogs in the freezer–something that would be a homemade meal, but that didn’t require me to make it right then. I also have a firm belief that food is ministry. We all have occasions in life that consume us for a season–a new baby, sickness, moving to a new home. It’s a blessing to have a friend show up with a prepared meal. I want to be able to deliver meals without having to plan, shop and cook. Because sometimes by the time I get all that done, the crisis has passed. 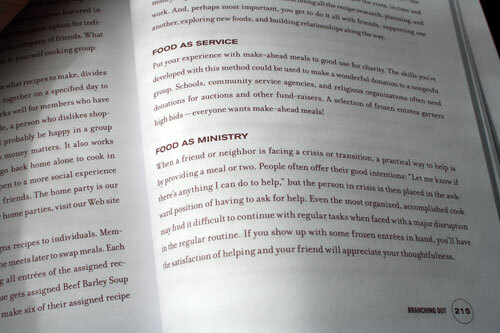 So I love that the authors included a few pages in the back titled “Food as Ministry”. a freezer inventory sheet that can be photocopied and hung on the fridge (at the top, of course, where your two-year-old won’t be coloring on it). On the sheet you can list what dishes are in the freezer, the date they went into the freezer, and a column where you can mark whether it’s still in the freezer, or if you’ve used it. lots of recipes that are either allergen-friendly, or adaptable to be allergen-friendly. Food that our family can eat together out of the same dish is hard to come by. freezer labels for every recipe with the name of the dish and how to prepare it from its frozen state. These can be photocopied and then taped to the storage container. No need to pull out the cookbook again to track down the recipe instructions. It’s all right there. So for the next couple of months, I’ll be exploring this freezer-cooking method. Care to join me? I think it’s going to be a worthwhile journey. * Please be assured that while the book was a gift from the authors, my opinions are my own. 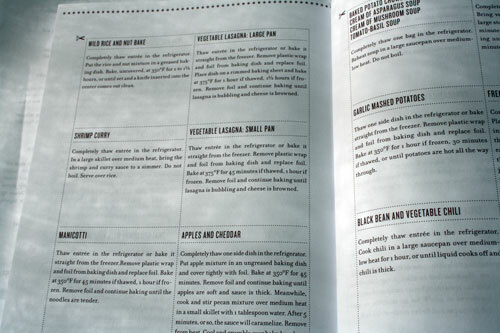 I am really excited to follow you on your exploration of this cookbook as this would be extremely useful to me. I have three boys all under 3 and one who just born in February. On top of that I do all the cooking for my household which includes my three boys, me, my husband, my mother, and my father who is disabled and whom I watch at home. I also am a full time student online………… so these freeze head meals sound great!!! Kimberly, My heart goes out to you. You must be one tired mama (and wife…and daughter…) I hope these meals help you out, just a little bit. They have been such a blessing to me. I wish I could share one with you tonight! Was excited to see you picked this book. 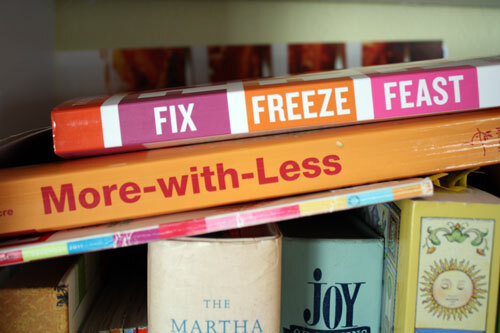 I have A LOT of freezer cookbooks and this one is my absolute favorite. I really like it this time of year since many of the recipes are marinades that can go on the grill. A couple that I do every time I do a freezer cook session are 4 b’s pork chops and the chicken with the tequilla and the margarita mix. It seems that lots of people like this cookbook. I’m excited to dig into it! This is a great book, I’ve checked it out at my local library and I ADORE it. 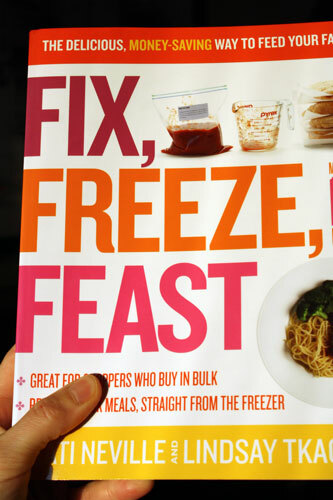 Best freezer cookbook ever! I am looking forward to this adventure. I have been desiring to do this kind of time-saving cooking for a while and now I can get in gear. Thanks! Tonight for dinner we are having chicken curry. That was frozen in January following the recipe in this exact book! I’ve loved the recipes I tried, and have been debating on buying the book, or borrowing it from the library again. I’m not always great at letting it defrost fully, but the chicken curry can go in the fridge overnight and then into the crockpot or I let it sit in the fridge all day, and just toss it in the pan on low and let it ‘melt’ while the rice cooks in the rice cooker. So simple! I have this book, or maybe another version. I LOVE it! There are two favorites I fix often, because the can go from the freezer straight into the crockpot. Gotta love those! Enjoy! Sonja, I’d love to know what your two favorite recipes are. Maybe we’ll try them!